I've been playing catch-up the past few days. Catching up on bills, some Etsy orders, neglected emails, dishes in the sink. Now it's time to do some blog catch-up! "Hatching Inspiration; Moments in Flight"
"Vintage Inspired Designs Made for Today"
Second, thank you for all the lovely comments about my Flare Clutches. I wish I were better at responding to your kind comments in a written form instead of chatting at my monitor as if you could hear me! Third, here's an update on my spinning adventures. I've been squeezing in a little bit of spinning between sewing projects. I find spinning to be very restful and meditative. Kind of like what sewing used to be before I started sewing "professionally." 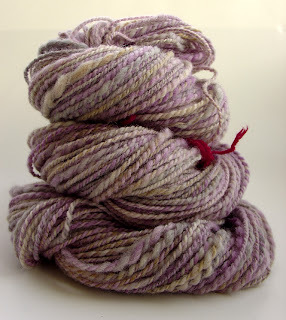 This skein is "Sonoma" from Maine Woods Yarn. This was my first attempt to spin and ply a large-ish chunk of wool using only my drop spindle. It's a little slubbier than I like. Here's my second attempt-"Hyacinth". I like that the yarn is more even. And I love the contrasting colors! 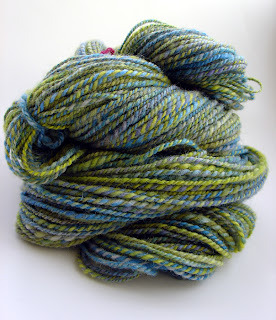 The roving for this skein also came from Maine Woods Yarn. I think I'm going to knit up some scarves for myself and the kidlings with these skeins. I'll let you know how it goes. What have you been catching up on lately? Oh wow! Your yarn is SO beautiful! Makes me want to start knitting again...but I have *zero* time for that! I've committed to way too many shows this season, so I'm trying to "catch up" with my inventory! :P Wish me luck! Are you doing any shows this season? I'm doing one show in mid-November. A friend of a friend is having a pre-holiday sale at her home. I'm sure your Tote2Go-s will sell really well! Well...with two toddlers the answer to that question is always 'laundry'. Other than that I've been trying to master the art on homemade bread. All of this 'research' has definitely been appreciated by the hubbs. He is in bread heaven. I am loving your yarns. As a knit-o-holic I am very impressed! Now I have somthing new to add to my 'Things I want to learn' list. Oh, I hear you, Plumm! I did 4 loads of laundry today and it didn't even make a dent! I'm awful at home-made bread. My loaves are always as hard as a rock! Spinning is lots of fun and easy, too. Your knitted hats are adorable-I bet you could spin up something cool for those! you inspired me to set a goal to sell 100 items in my etsy shop too (at the time, i was at 60something)...because of my goal, i payed more attention to it, and i am now at 107!! The school book fair that I chair is over and I have a new design in my head - a little more expensive, but Christmas is coming, so I am going to give it a shot! Beautiful Maia!! LOVE the Hyacinth one!! Gorgeous colours you chose to play with!! You are tempting me to take up spinning again, and I HAVE NO TIME! EEP!